When my colleague at The Income Store asked me to take over Netflix Update during her maternity leave, I was overjoyed. After all, I — along with several people on my writing and editing team — love Netflix. Most of the sites we work on are focused on search engine optimization. This one features more timely content and relies more on social media for driving traffic. 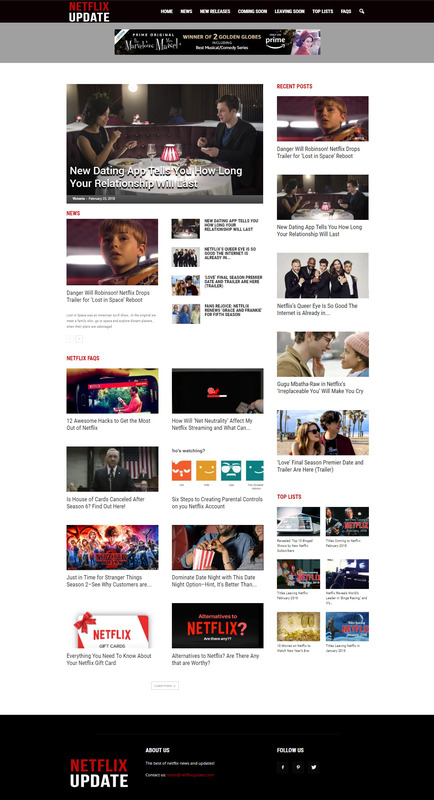 We published one or two posts per day with trending Netflix-related news and “best of” lists, along with tips and tricks. At the end of each month, we published a long list of all the movies and TV shows coming to Netflix and leaving Netflix for the U.S., U.K., Canada, and Australia/New Zealand. We updated the list on a weekly basis. Also, I curated and posted content for our Facebook page and sent out a monthly newsletter via MailChimp. How Will Net Neutrality Affect My Netflix Streaming & What Can I Do About It? Tools: WordPress, Photoshop, Yoast SEO Plugin, AHREFs – Competitive Research Tools and SEO Backlink Checker, Buffer, MozBar, SemRush, Google Sheets, and Grammarly. Here’s a screenshot from the Netflix Update’s home page. Oversaw a team of 10-15writers and editors to create engaging, high-quality content for Income Store websites.